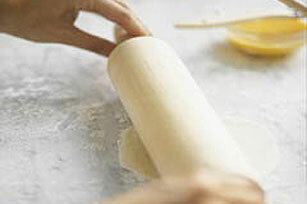 Make your own empanadas at home with our Empanada Dough recipe. It only takes ten minutes, but deciding what goodies to fill it with could take much longer! Combine flour, baking powder and salt in large bowl. Cut in lard with pastry blender or 2 knives until mixture resembles coarse crumbs. Gradually add water, stirring until mixture forms ball.